Staff Writer Elena Piech spoke with Jennifer Campbell, Ithaca College's new associate vice president of marketing, about her plans for the college's marketing strategy. Ithaca College is in the process of changing its marketing strategy. In mid-November, the college hired Jennifer Campbell as the new associate vice president of marketing communications to carry this out. Campbell graduated from West Virginia University with a Bachelor of Arts in English, philosophy and French in 1997 and a Master of Arts in English in 1999. From 2005 to 2015, she worked in several communication departments for Cornell University. Staff Writer Elena Piech spoke with Campbell to discuss her move to South Hill, future marketing plans and her opinion of the college. Elena Piech: What is your involvement with marketing at the college? Jennifer Campbell: Not to sound too lofty, but really I’m leading the team who is responsible for making sure that all of our key audiences have as fruitful as possible of an experience at Ithaca College. 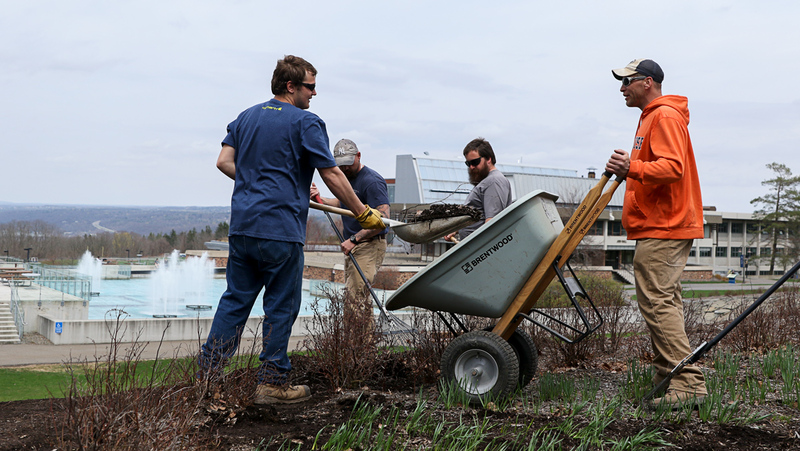 What I’m hoping to do is do things that elevate our reputation, elevate our visibility — pull out the ingredients that make Ithaca College particularly amazing — particularly unique. EP: I also understand that you came from Cornell University. What did you do there? JC: I lead the Advancement Marketing and Communications team for most of my time. For my last three years, I was the leader of that group. Before that, I was mostly in Advancement Communications, which is mostly a combination, just like it is here, of alumni relations, fundraising communications and also quite a bit of community and public relations sort of work. I also spent some time in the central university communications group that was kind of responsible for news and communications and campus relations. EP: What’s it like being on this side of the hill? JC: You have a far better view. Everybody who says that is absolutely right. I think it’s been a strange time to arrive here at Ithaca because there’s been such vibrant conversation on how Ithaca ought to be run and how the community needs to be treating one another. What’s interesting to me about that is, observing Ithaca from afar before I got here, it looked to me like one of the best things it had going for it was that sense of community. It’s not as huge a place. It’s not a giant, sprawling research university. It’s a relatively small community of people who relatively do know each other. Even watching the disagreements unfolding right now, people are really trying to hold themselves and one another to a very high standard for what it means to be a community here. EP: Do the discussions and movements with race on campus impact your job right now? JC: As intense as it’s been, it’s been the best possible orientation in terms of being able to see really deeply, really quickly, what the community is asking for. All of the issues that are going on on campus right now absolutely have to be a priority. I think that we have to be part of the solution. I’m really excited to be part of that solution. EP: How do you see your staff being part of the solution? JC: At its root, really good communications isn’t just pushing out information. That’s just one thing. Before you even know what information you need to push out, you need to be listening to what other people say that they need. We don’t have plans for this yet, but I really want our team to partner with the people doing the programmatic work on campus to figure out how we might be able to host really productive conversations in communications spaces that can actually help move things forward. EP: Besides campus climate, what other projects are you involved in? JC: The team here is working on an active revamping of the Ithaca.edu website. They’re just in the vision and planning and analysis stage yet. So it’s not off the ground, but that’s going to be a very big deal. I’m just getting my feet wet now. I have meetings to meet with each dean and to see what they are experiencing — good and bad — about the switch with the communications department. EP: Even though you’re just getting your feet wet, do you have any plans for your future here?